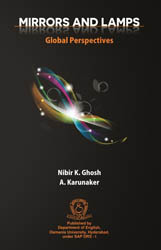 Mirrors and Lamps: Global Perspectives, edited by Nibir K. Ghosh and A. Karunaker, brings together writers, academics and scholars from various parts of the world to discuss and deliberate on issues and concerns central to the human predicament through different times and climes. Be it the sphere of the racial dilemma, diasporic ambivalence or a simple but determined effort to negotiate domestic space, one cannot miss the resonant voice of change that emphatically articulates how “poetry” can and does make everything happen! The creative and critical renderings that appear in this collection may mirror the stark reality of calamities, conflicts and apocalypses but they also inspire us to believe that lamps of compassion, peace, harmony and brotherhood will ultimately dispel the darkness that surrounds us on all sides. The book is undeniably enriched by Sandeep K. Arora’s elegant cover graphics.